MSI has announced the official launch of its X-Slim notebooks, with the 13 inch X350 and 360s, the 14 inch X420 and the 15.6 inch X620 all being shown off in Las Vegas. All the X-Slim notebooks feature the Intel CULV platform with Intel Core 2 Duo processors, and the flagship X620 has already won a German design award apparently. What's the best Core i3 laptop? 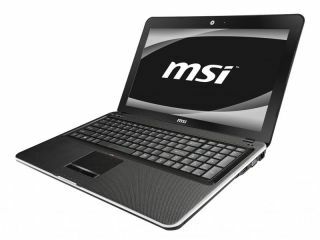 What's the best Core i5 laptop? What's the best Core i7 laptop? The new slimline 15.6 inch MSI X620 has a 16:9 cinematic LED backlit display, built in ATi Mobility Radeon HD Discrete graphics card and a 3D Boost button which MSI claims makes it great for gaming. Apparently the X620 has an impressive 10 hour battery life, 2-spindle optical drive and a total weight of only 2.4kg. The X420 offers consumers a 14 inch HD widescreen display in 16:9 format, with HDMI and Bluetooth, weighs in at just 1.5 kg including battery, and is less than one inch thick. The X420 comes in what MSI describes as a 'gorgeous cappuccino brown colour' and has ATi Mobility Radeon HD 5430 discrete graphics card with 1GB DDR3 VRAM, Intel's Core 2 Duo processor, 3D Boost and a battery life of 'up to 9 hours'. "The X420's star feature is its full support for two of the latest mobile broadband technologies, 3.5G and WiMAX. These technologies allow for anytime, anywhere enjoyment of wireless connectivity and mobile operating efficiency," adds MSI's release. The other notebooks included in MSI's newI X-Slim range are the 13.4 inch X350 and X360 notebooks. "These similary to the X420 and X620 are slim and stunning in design and offer an array of excellent features," says MSI, without giving full details. The new MSI X-Slim X620 has a UK release date of April 2010 priced from £700.